I haven’t actually bought any mascara myself for months now as I appear to have accumulated a stash of them, but I only really use one or two different ones at a time because mascara has such a short shelf life. However, a friend bought me this as a present to say thank you for giving her a lift somewhere and I was so intrigued by the 2 in 1 magic cap I had to open it and take a look. I’m not sure where my friend bought this from but I was disappointed to find one of those awful security stickers on it. I tried to take it off because it was white and stuck out like a sore thumb on the packaging and now I’ve been left with this sticky mess that I can’t get off. I don’t think Boots do this but I believe Superdrug may do? To any shops that use these, PLEASE STOP! I have to admit that just looking at the packaging I was completely baffled as to how this might work (I’ve never claimed to be bright!). 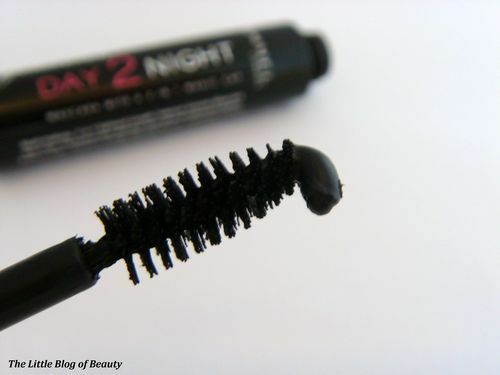 I thought to myself, will the top cap reveal just a tiny brush that goes into a small tube of mascara in the second cap? But then one part would run out way before the other part but maybe that’s because that’s the ‘night’ part and you’re only supposed to use that occasionally? Well, dismantling the whole tube revealed how it works. 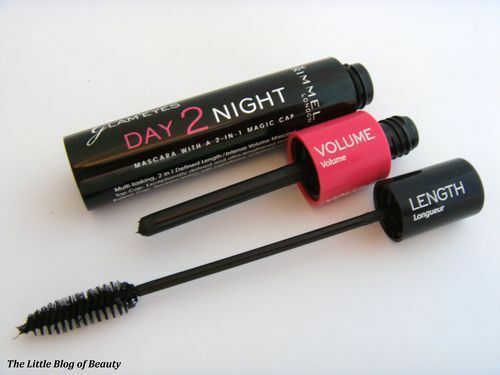 Unscrewing the top cap reveals a brush with a long skinny wand and unscrewing the second cap (with the top cap still in place) reveals a normal looking mascara wand. It’s only when you then separate the two lids that you discover how it works. Warning! If you’re going to separate the two lids make sure you do it by starting with the whole thing together, removing the top cap first and then removing the second cap. 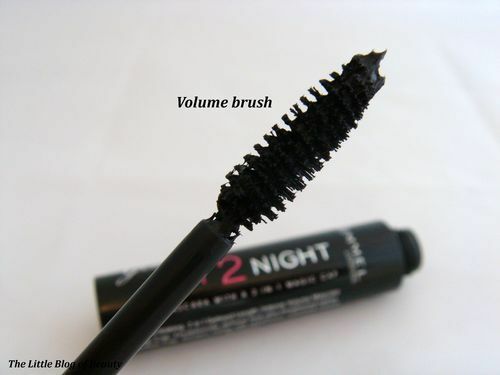 If you remove both caps together this gives you a standard mascara wand with a heavily loaded brush that provides volume. 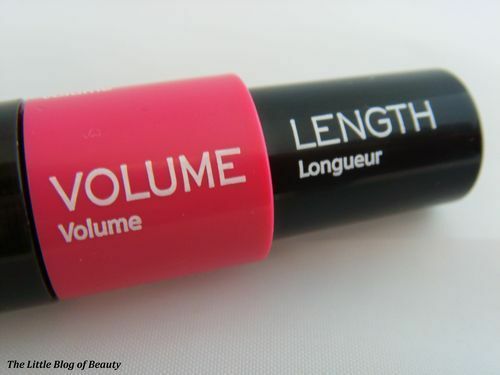 If you remove just the top cap this pulls the brush through the wider wand which removes much more mascara and leaves you with a ‘barer’ brush that you use for length. Another warning! 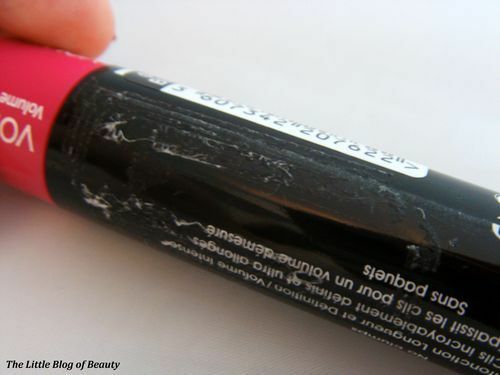 Make sure you don’t push the brush back through the larger wand until you’ve attached this to the tube again or you’ll end up with this unattractive sight and a possible mess! I’ve been using this for a few days now and I do really like it. 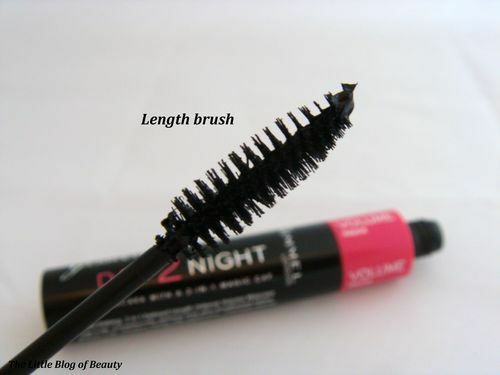 I’m not sure that the length brush gives you much additional length (maybe just the illusion of length because your lashes aren’t as loaded with mascara) but it does define and separate your lashes nicely and darken them (this will obviously only be the case if you have lighter coloured lashes like me). 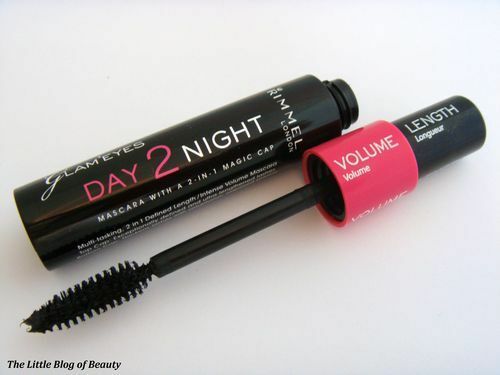 The volume brush then adds a thicker layer of mascara over the top to plump up your lashes to a more dramatic volumised look. 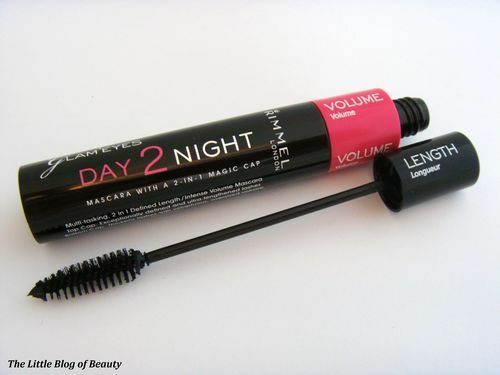 I normally only apply one layer of mascara as once one layer has dried I personally find it awkward trying to apply more mascara over the top. However, I find applying more than one layer much easier with this because the first layer is much ‘thinner’. 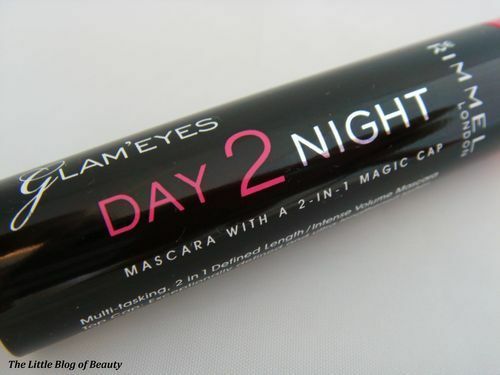 This lasted really well and didn’t flake or smudge, even when I fell asleep for a few hours with this still on. Although I haven’t suffered with hayfever at all for the last couple of years (which is a miracle as I had severe hayfever for many years prior to this) I have been suffering recently and this managed to survive intact through my watery eyed problems (although when I’m suffering from hayfever I don’t apply mascara to the bottom lashes). This was also easy to remove, although I did find that I obviously hadn’t removed it all the first day when I woke up to slight panda eyes the following morning. 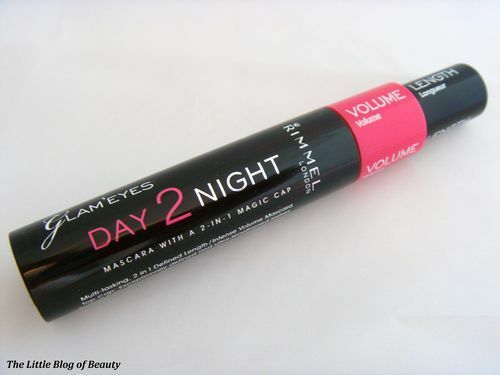 Rimmel Glam’eyes mascara is available for £7.99 from Boots, Superdrug and other Rimmel stockists.